The first phase of the 2017 UP assembly elections were concluded at 5pm on Saturday with 64.22% of the electorate in western UP coming out to vote. Polling took place in 73 of the state’s 403 assembly constituencies, spread across 15 districts in the western part of the state. A total of 839 candidates were in the fray. In this phase, around 2.59 crore voters were eligible to exercise their franchise. In the 2012 assembly polls, of the 73 seats -- SP had won 24, BSP 23, BJP 12, Rashtriya Lok Dal 9 and the Congress 5 seats. In the 2014 Lok Sabha elections, the BJP had won all the 12 seats in the region. 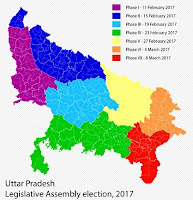 The region was earlier a stronghold of Mayawati’s Bahujan Samaj Party (BSP), and whether she gets the CM’s chair or not will depend on how the BSP does in these 73 seats.